Have you ever heard of recasting a mortgage loan? We’re assuming not. It’s a little-known tool that allows you to lower your monthly mortgage payment without having to refinance. Sounds great, right? Well, it is a great option for some, which is why we want to help you learn a little more about recasting. To recast a mortgage loan, you need a lump sum of money to put towards your mortgage. We recommend at least $10,000 to really make a difference in your monthly payments. In addition to a lower monthly payment, the lump sum will decrease the principal on the loan, meaning you’ll save on interest and pay less over the life of your loan. Recasting a mortgage loan does come with a cost, though. Generally, a lender will charge you a $200-350 administrative fee. Recasting is a great option for a lot of homeowners. If you’ve recently come across a lump sum of money and your financial situation is changing, say you’re expecting, recasting your loan can help lower your monthly payment because you know you’ll have higher living expenses in the near future. Recasting can also be a good idea if you’re looking to sell your home in the next couple of years. The lower monthly mortgage payment can make your debt-to-income ratio better, meaning you’ll likely qualify for a lower interest rate when the time comes to buy. Both recasting and refinancing help you save money over the life of your loan and lower your monthly payments. So, what’s the difference? Well, recasting is an easier process. There’s no need to requalify for a loan since you simply keep your existing terms and rates. It’s the best choice for those looking to save money when interest rates are higher than their current rate. A good rule of thumb when choosing between recasting and refinancing is this: If you currently have a fixed-rate loan with a low interest rate, recasting is the way to go. 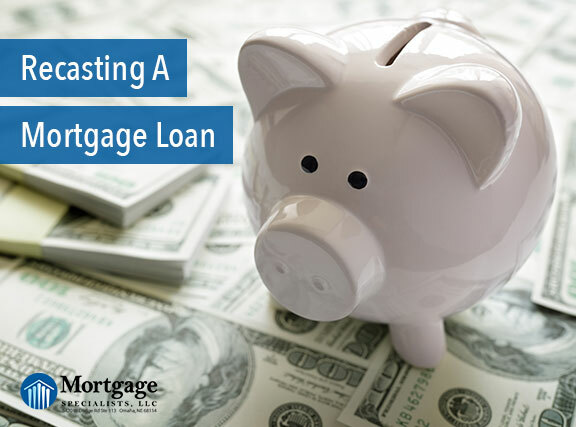 Have additional questions about recasting a mortgage loan or are ready to get started? Give us a call at (402) 991-5153. We’d love to help answer your questions whenever works best for you!